I'm loving my latest WiP! but that's what I went with because that's what I had enough of, and quilting will add some texture I'm sure. It's all looking very a la Jen Kingwell to me, kind of appealing & vintage-y! ... hm-m- and maybe a striped floral or b&w stripe for binding? I love to look at all those fabrics. 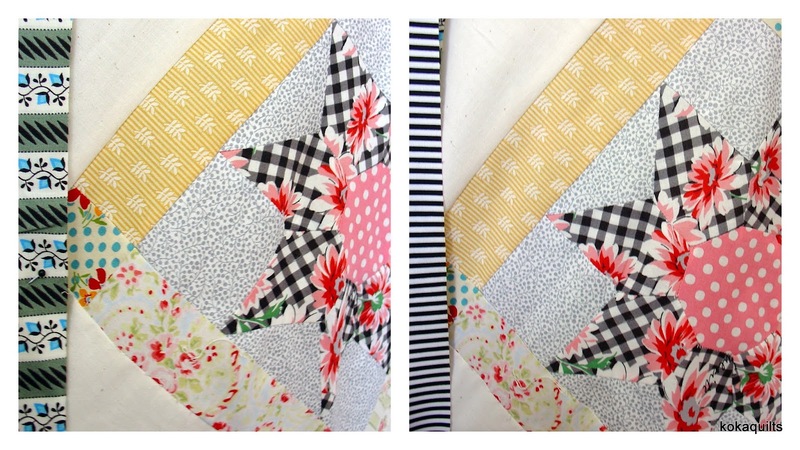 All the different sashings add so much extra to this already gorgeous quilt! What a lovely quilt! 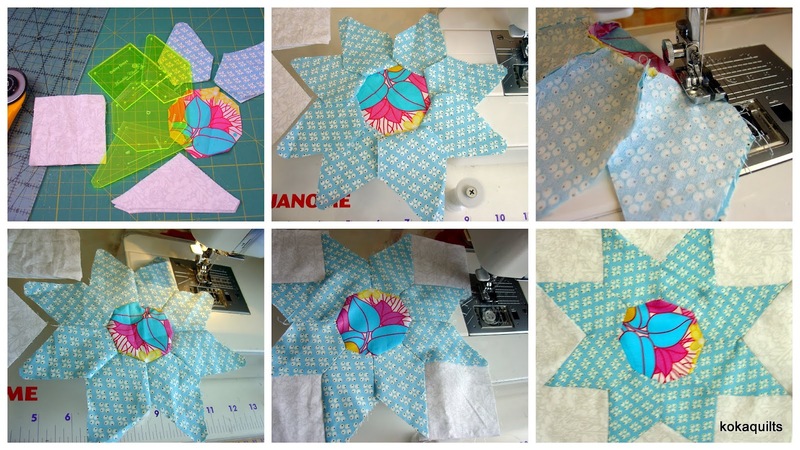 All the different fabrics you have used in the Daisy blocks are gorgeous and your idea to make each piece of sashing and every cornerstone from different fabrics works so wonderfully well. I would never have had the idea to do that - and certainly not the confidence to pick out the right bit of fabric for each bit of sashing. Great finish! It was fun to make, a trip down memory lane with some of those fabrics! The sashing just adds something extra doesn’t it? I used another pile of lightish fabrics as I didn’t want to overpower the main blocks. Hopefully the daisies/stars still shine! Very pretty. How big is each block? Thanks Karyn. The blocks finished at 8 1/2" with 1 1/2"sashing. 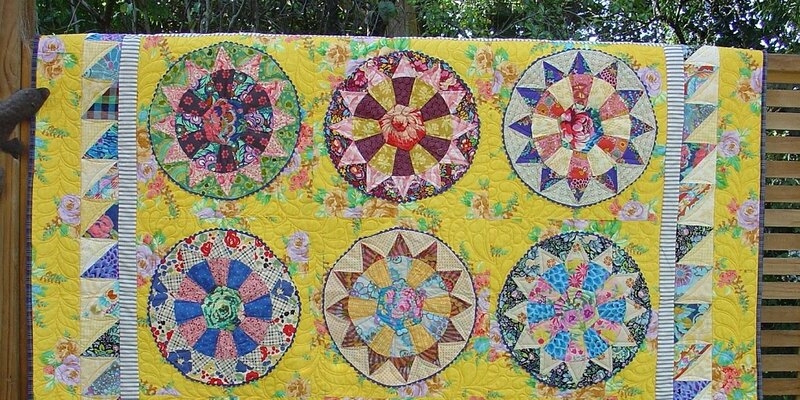 This is such a lovely quilt and the fabrics you have chosen are perfect! I like your idea of black and white stripe for the binding too. This is a fabulous quilt! I love the scrappy blocks. It always surprises me to see how well all these different fabrics work together. So many pretty fabrics in your daisy blocks. What a fun way to use all those scraps. Very pretty - I love all those lovely fabrics! Ooh, it's lovely! I like your scrappy sashing a lot. Wonderful quilt top!! Looks old, yet new. Really lovely. Oh so pleased to see the full shot of your lovely quilt, and yes it is very Jen Kingwell. I second Nifty quilts, it does have a lovely old fashioned look to it. It's beautiful and I love how you did the sashing too - perfect!! The variety of prints is so eye catching! Not to mention the block itself! I admire that you stuck with it too! It could easily have been set aside. Calico...I haven't used that word in years! Can't wait to see your quilting! It does have a Jen Kingwell vibe about it! This looks like a difficult block. I love the way you mixed the retro '30's fabrics mixed with the bolder prints. The quilt is lovely. Lovely! It is very vintage looking. I love the black and white striped binding with it. That scrappy sashing is just absolutely the perfect choice, and setting the blocks on point really makes them dance! Such a gorgeous quilt! And I'm voting for that stripy binding! It'll be a nice twinkle on the edges. 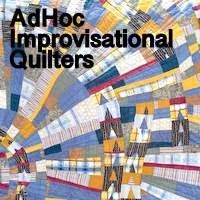 This quilt is so much fun to look at! The pretty, scrappy fabrics make me smile! Definitely a finish to be pleased with! I love how these blocks look set on point Linda - so pretty! Striking! Love your fabric choices. I'm so glad to see these blocks become a quilt, Linda. I can't tell you how happy seeing this top makes me. The fabrics, the colors -- all are joyful and gorgeous! Well done.